Last summer I took a trip around the coast of South Wexford on my bike, visiting many places I had never been to before. It struck me that there are many other places in Ireland that I had never been to - for example I have never seen the Giant's Causeway, nor have I ever been to Derry city. Some parts of Ireland, like Co Donegal, I have only been to once or twice. Having been on my bike to Wales, England, France, Spain, Andorra, and Portugal - I decided that my bike trip this summer would be one around Ireland. I am calling my trip the "100 Corners of Ireland"! 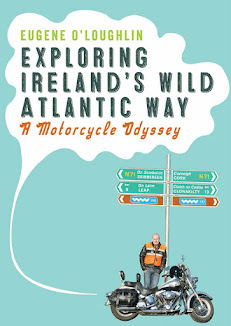 So - for the next two weeks (or thereabouts), I will be riding around Ireland by the coastal route. One of the first questions I have asked myself is "How long is the Irish coast line?". The recent Round Ireland Yacht Race was 1,125 km by sea, but on land - what would it be? It all depends on how you measure it. According to the World Factbook, Ireland's coast line is 1,448 km long, while the World Resources Institute indicates the Ireland is the country with the 38th longest coastline in the world at 6,437 km (source: Wikipedia). According to Wiki Answers Ireland's coast is 7,500 km (4,660 miles) long. The Ordinance Survey of Ireland has our coastline at 3,171 km (1,970 miles). Who is right? I will note the distance I travel, which will of course be by road. I don't intend to go down every boreen around the coast. I will be using the OSI's Official Road Atlas Ireland as my guide, so if a road is not on it I won't be travelling on it. I do intend to both blog and tweet my way around the country - connectivity permitting. I hope to do all this with my iPhone and iPad. I have no plans for staying in any particular place - cheap hotels, B&Bs, plus the odd scrounge for a bed (all offers welcome! ), should get me around. Weather permitting, Wednesday is the day of departure!